"Compassion is the currency of losers." Profile: With not a trace of mercy to be found among his microchips, Cutthroat, not surprisingly, enjoys a reputation for mindless savagery and excessive destruction. His antics even shock some of his fellow Decepticons in their extremeness; his preferred fighting style is lashing out with wings, beaks and claws until he's reduced his adversary to metal ribbons. Though many of his allies privately bemoan the energy wasted in Cutthroat's lethal zeal, none has had the courage to attempt to talk to him about it. They know that if they antagonize Cutthroat, he might just as soon turn his insatiable lust for destruction on them as on the Autobots. Abilities: In creature mode, Cutthroat can leap up to four miles and, if he catches the right breeze, has been known to glide for short distances. He can shoot a stream of 800 degrees Fahrenheit flame from his mouth. His beak, wings and claws can slice through all but diamond and a few rare iron alloys. In robot mode, he carries a double-barreled magnetizer, which charges any metal target it hits with powerful, opposite magnetic fields so that the target literally tears itself apart. 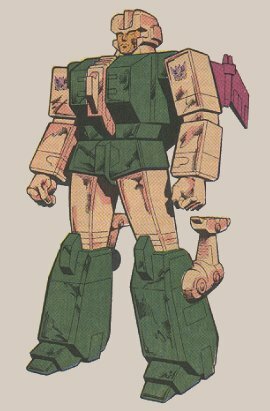 He combines with his fellow Terrorcons to form the giant robot known as Abominus. He prefers not to do this since he considers Abominus too "tame" for his tastes. Weaknesses: Cutthroat often recklessly uses his difficult-to-control leaping and gliding abilities, and consequently, often ends up in situations where he does not have the advantage. His excessive use of force often leaves him depleted of energy and vulnerable to attack.